Strawberries are not only easy-to-grow; a few strawberry plants can even produce an abundance of fruit. This may be one reason they are the most popular small fruit grown for the home garden, according to Bruce Bordelon of the Department of Horticulture at Purdue University. Before starting strawberries, keep in mind that for the best flavor, strawberries prefer being grown where days are between 70 and 80 degrees F and nights are between 60 and 65 degrees F.
Dig up the area for planting the strawberries, using a spade or a rototiller, down to a depth of between 12 and 14 inches. Do this in the spring as soon as the soil is soft enough to work with. Spread out a 3 to 4 inch layer of aged manure or well-aged, dehydrated compost over the soil in the planting area. Mix the amendment into the soil thoroughly using a garden fork, a spade or a rototiller. Spread out over the top of the soil in the planting area approximately 1 pound of 3-2-2, 6-24-24 or similar fertilizer for every 50 square feet of planting area. Mix the fertilizer thoroughly into the top 6 inches of the soil. Create 5- to 6-inch-high rows of soil that are spaced approximately 36 to 48 inches apart. Level out the top of each row using the rake or shovel so they are 6 to 12 inches wide. 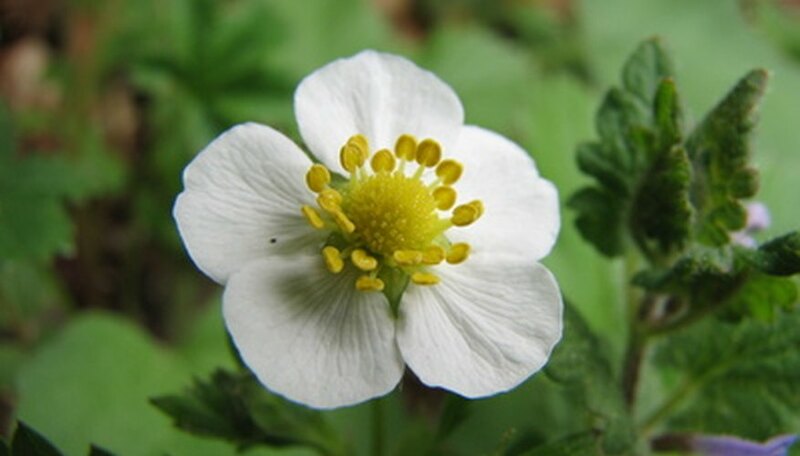 Purchase bare-root strawberry plants, or starts, in early spring, late March through April. If you have access to established strawberry plants, you can take starts off the runners. Look for strawberry starts that have 3 or 4 leaves. Each start will appear at the end of a runner. Cut off the start from the runner and proceed from Step 3. Trim off any dead leaves from each of the strawberry plants. Pour water into a bucket until there is about 2 inches of water in it. Set the roots of each strawberry plant into the bucket to soak for 1 hour. This helps to plump up the roots. Dig holes that are twice as deep and wide as each strawberry plant. Each hole should be between 8 and 14 inches apart. Place one strawberry plant into a previously dug planting hole. The crown of the plant should not be buried, but should be sitting level with the adjacent garden soil. The crown is the thick, fleshy part where the leaves of the strawberry plant meet the top of the root system. Scoop in soil around the strawberry plant, firming it down gently as you proceed. Measure out 2 to 3 tablespoons of a starter fertilizer such as 10-10-10 or 5-10-5. Mix the starter fertilizer into 1 gallon of water. Water each strawberry plant with approximately 1 to 2 cups of the water and fertilizer solution. During their growing season, water strawberry plants with between 1 and 1 1/2 inches of water per week if there is no rainfall.